Three (3) American Independence Memorial ephemera items. 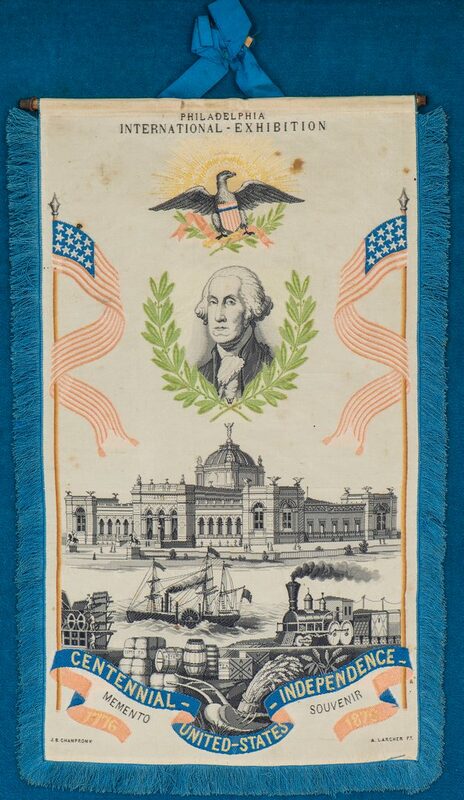 1st item: 1876 Philadelphia Centennial Exhibition stevengraph silk souvenir ribbon, designed by J. B. Champromy, printed by A. Larcher. 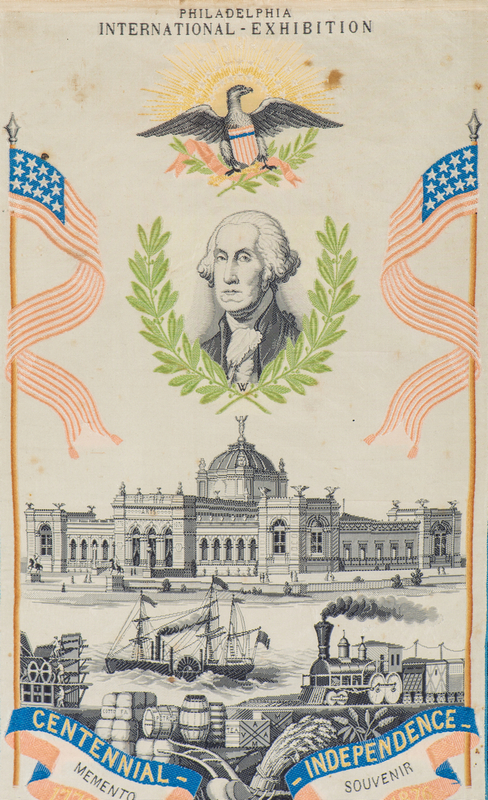 The ribbon depicts the portrait of George Washington above a laurel wreath, surmounted by a stylized version of the Great Seal of the United States and flanked by two American flags with 13 stars above black and white images of the Memorial Building/Art Gallery on the Fairmount Park grounds and industrial images that relate to Pennsylvania. Blue silk tassels surround the ribbon with a hanging rod and blue grosgrain ribbon at the top. 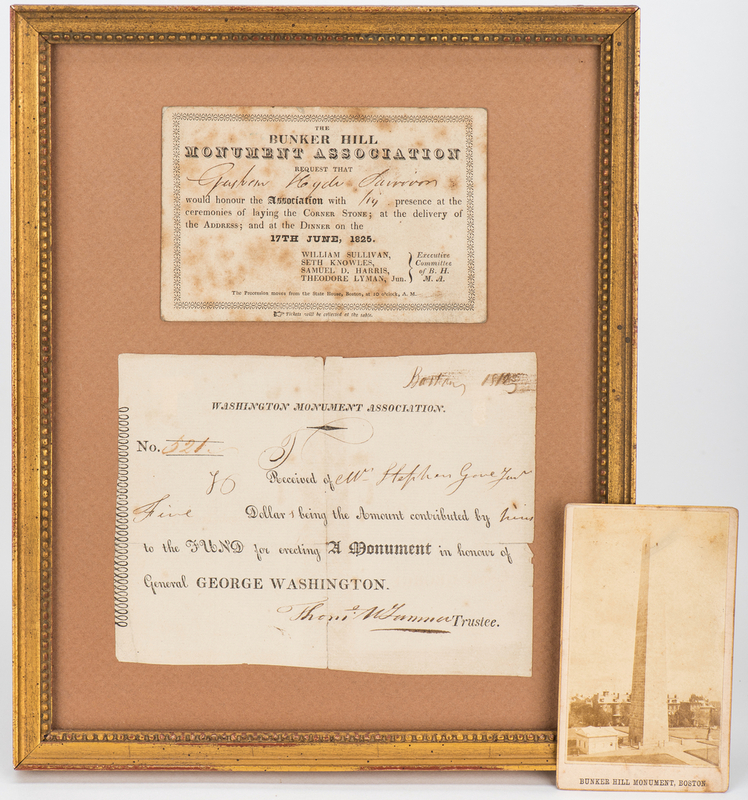 Turner Art Gallery, Denver, CO label and pencil notations with date "12-9-75", en verso. 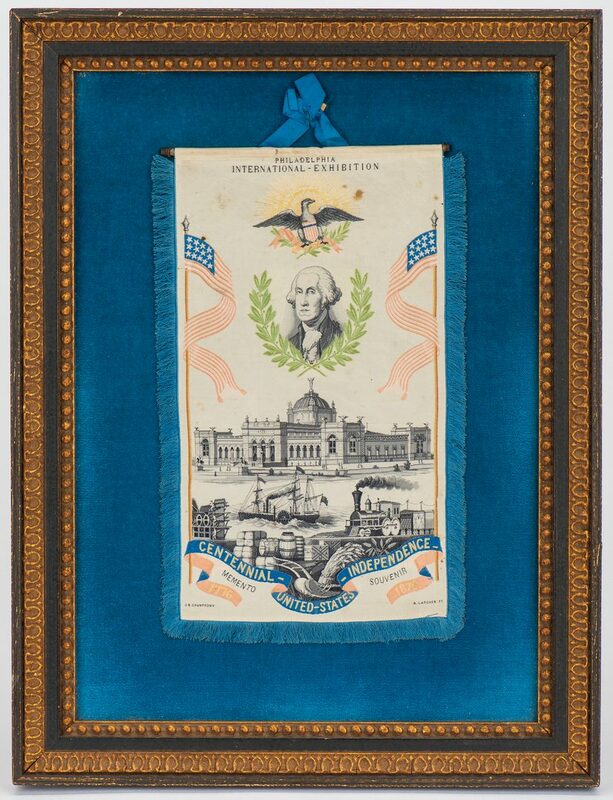 Laid on blue velvet backing and housed under glass in a black painted frame with gilt lamb's tongue running pattern and bead course rabbet edge. 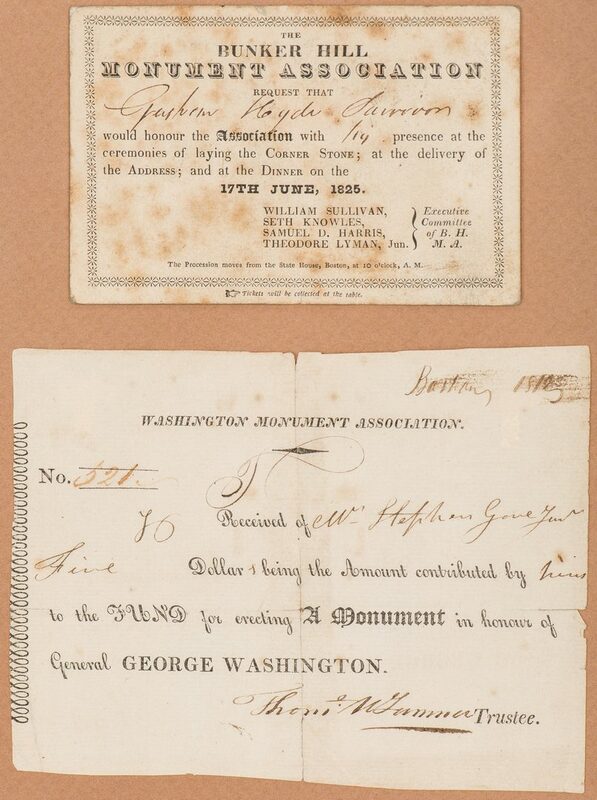 Ribbon – 12 3/4" H x 7" W. Sight – 14 3/4" H x 10 3/8" W. Framed – 17 3/8" H x 13 1/4" W. 2nd-3rd items: Two (2) documents related to the Bunker Hill Monument Association (B.H.M.A.) 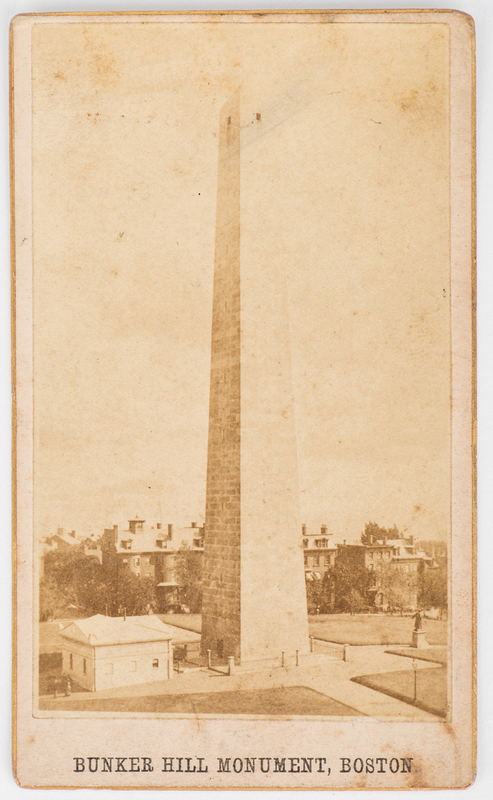 and the Washington Monument Association. 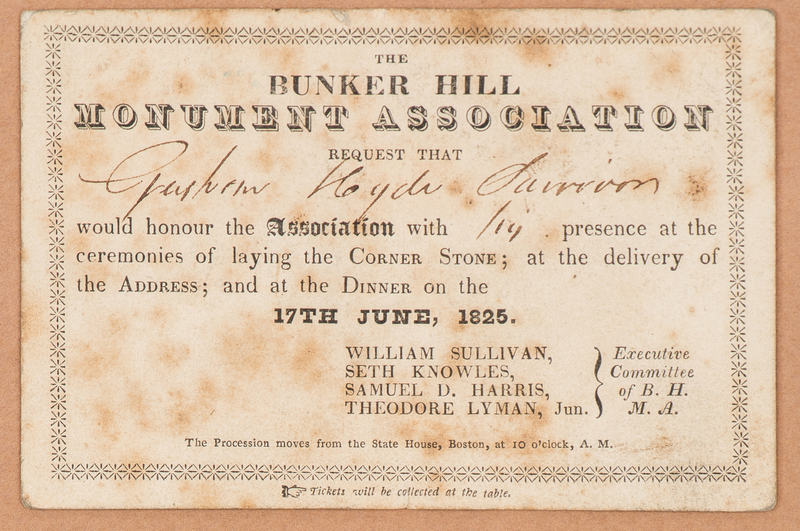 Includes a ticket issued to Graham H. Jarrion, requesting his presence at the "ceremonies of laying the Corner Stone; at the delivery of the Address; and at the Dinner on the 17th June, 1825" with the names of the Executive Committee of the B.H.M.A. below. 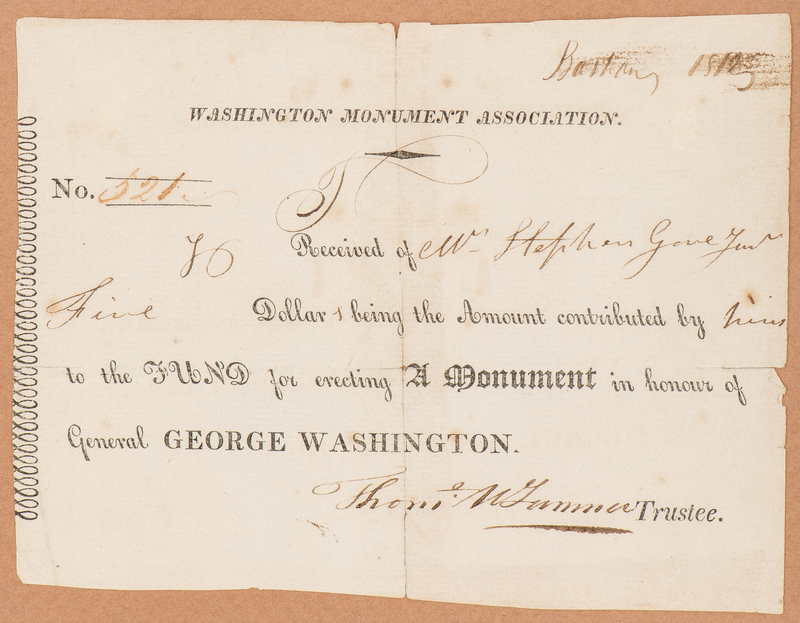 Also included is a Washington Monument Association receipt stating that "Mr. Stephen gave Ten Five Dollars being the Amount contributed by him to the Fund for erecting A Monument in honour of General George Washington" signed by the Trustee of the association, in Boston, MA, numbered 521, and dated 1812. Turner Framing Inc., Great Falls, Falls Church, VA label and envelope containing a CDV of the Bunker Hill Monument, a vintage brochure from the monument, and a magazine clipping about the monument, en verso. 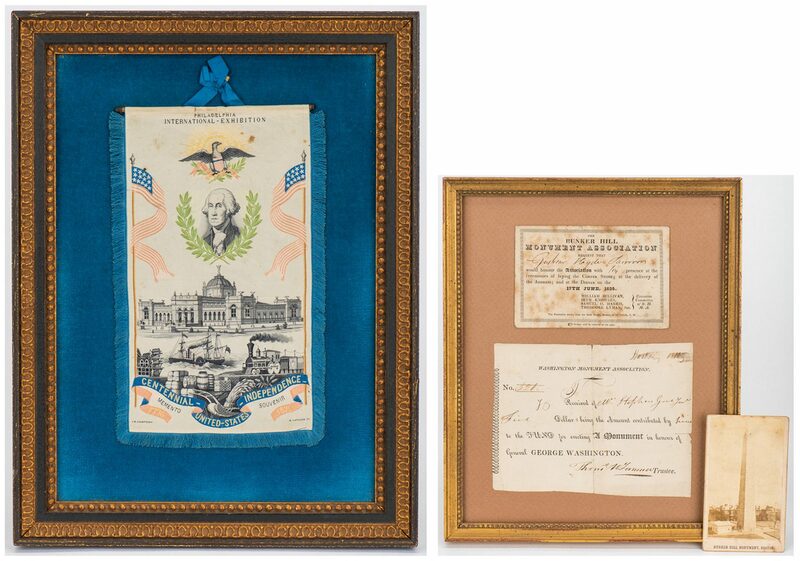 Both items laid on light pink brown card stock and housed under glass in a gilt wood frame with bead course rabbet edge. Ticket – 3 1/4" H x 4 3/4" W. Receipt – 4 5/8" H x 6" W. Sight – 9 7/8" H x 7 3/4" W. Framed – 11" H x 9" W. Provenance: The collection of internationally known ragtime pianist and historian Johnny Maddox, Gallatin, TN. CONDITION: 1st item: Overall good condition. 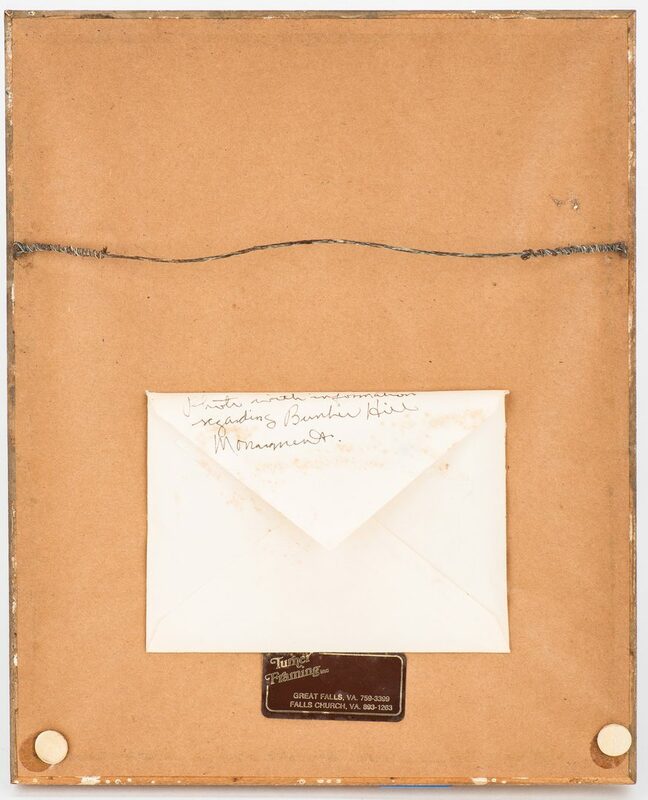 Minute foxing spots and stains, largest 1/4", surface of ribbon. Not examined outside of frame. 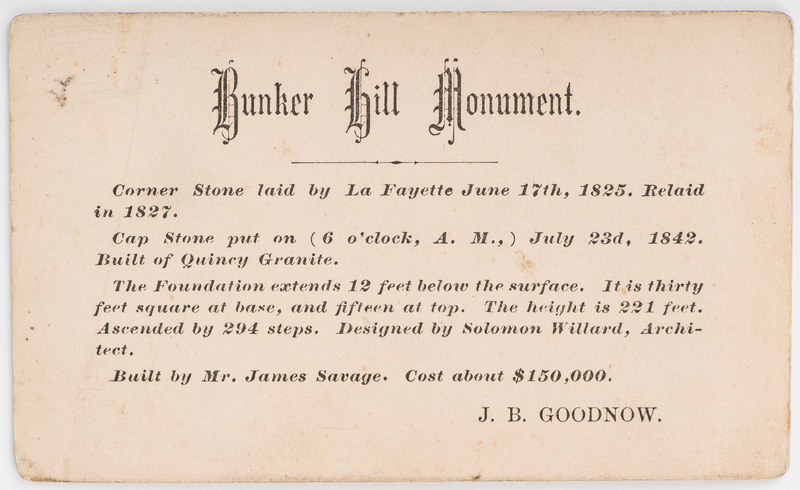 2nd-3rd item: Overall good condition with foxing spots, smudges, etc. to be expected from age. Tears, largest 1", along fold lines of receipt. Not examined outside of frame.